The major traveling exhibition CUT! 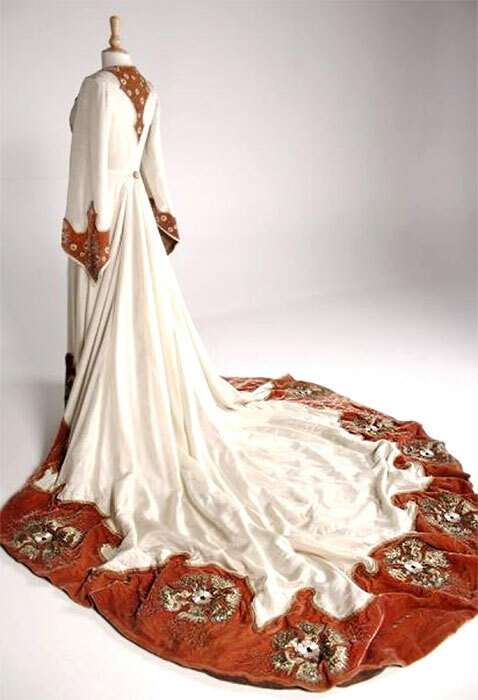 Costume and the Cinema is on view at the Brigham Young University (BYU) Museum of Art through December 6, 2014. It will feature forty period costumes created for more than two-dozen popular motion pictures by London costume house Cosprop Ltd. Films represented in the exhibition depict five centuries of history, drama, comedy, fantasy and adventure through costumes worn by such famous film stars as Johnny Depp, Keira Knightley, Ralph Fiennes, Daniel Craig, Kate Winslet, Sandra Bullock, Uma Thurman, Anjelica Huston and many others. In all, more than 30 actors will be represented from 27 films, including Academy Award-winner The Duchess and perennial favorites Sherlock Holmes, Pirates of the Caribbean, Sense and Sensibility and The Phantom of the Opera. 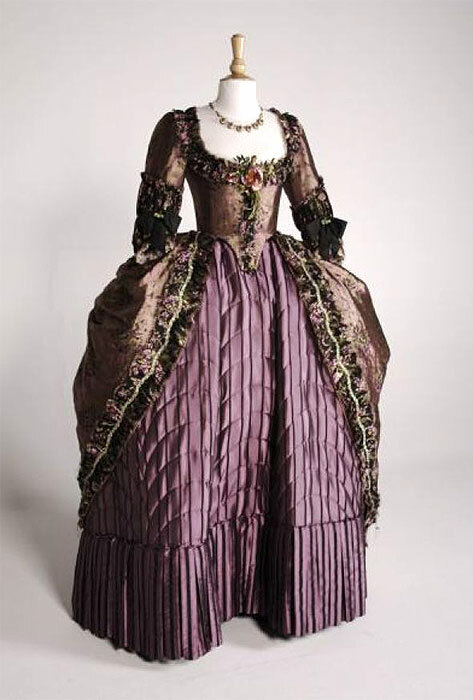 One of Keira Knighley’s costumes from “The Duchess,” a chronicle of the life of 18th century aristocrat Georgiana, Duchess of Devonshire, who was reviled for her extravagant political and personal life. Since 1986, when the Academy Award for Costume Design was first awarded to a Cosprop designer for A Room With a View, the company has supplied costumes for 34 nominated films. In 2008, three of the five Oscar nominees included Cosprop designs; in 2009, the Academy Award for Costume Design was awarded for The Duchess; in 2011, the Emmy Award for costume Design was awarded for Downton Abbey – the highest accolades for a designer and the costumers that provide the film’s costumes. Like their period prototypes, these opulent costumes are crafted of sumptuous fabrics and decorated with intricate embroidery and lace. One of Kate Winslet’s costumes from “Finding Neverland,” a story focusing on writer J. M. Barrie and his relationship with Sylvia Llewelyn Davies and her sons, who inspire the classic 1904 play Peter Pan, or The Boy Who Never Grew Up. Davies met Barrie in 1898 at a dinner party, discovering he was already friends with her three sons from their regular visits to Kensington Gardens. Nancy Lawson, a costumer who has worked for productions in Broadway and Hollywood, accompanies the exhibit on its tour of museums. Lawson maintains that “Cut!” is about so much more than just costumes. Within the various fabrics, stitching patterns and fits, there are hidden lessons about the social and economic realities of these bygone time periods. This is especially true in the period represented in “The Duchess,” the 2008 film starring Keira Knightley. The film is legendary among the costuming community for its vivid, painstakingly crafted costumes. The wealthy class in late 18th century England, for example, gambled excessively. Fortunes would be won and lost in a single night. For this class, their clothes often had thread made of real gold. If clothing went out of style, or considerable money was lost on gambling, they would burn their clothes. The cloth would disintegrate, but the gold thread would remain. The Museum will host a Exhibits Development Group that takes an in-depth look at the art of making costumes that set the scene, establish character and provide authenticity in period films. As an educational supplement to the show, the BYU Museum of Art will also display a selection of works from the Museum’s permanent collection to demonstrate how wardrobe details served similar purposes in portraiture from many of the same eras and settings as are seen in the featured films. "Bathing is a sport ... Enjoyed by great and small ... In suits of any sort ... Though better none at all."